Computer-modeled mold shape promotes an optimized “footprint” for maximum road contact and stable, confident handling. 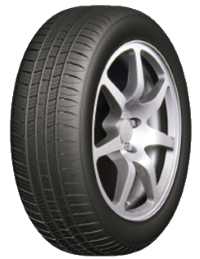 An all-new asymmetric tread design provides excellent handling in both wet and dry conditions, as well as good capability in light snow. An all-new silica-enhanced high performance tread compound provides excellent wet and dry handling, as well as good treadwear.